I recently began to use mind maps again for some of my keyword research projects because they offer an excellent way of visualizing keyword connections which are an important part of keyword research. 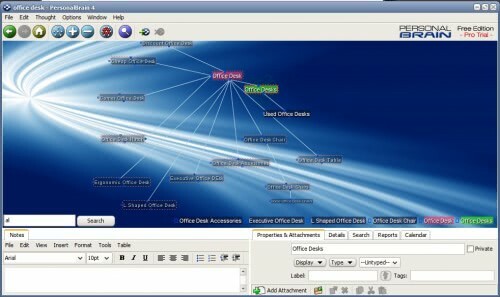 The Open Source mind mapping softwareFreemind was my application of choice for the first few projects. It worked well but had a few scaling problems among other issues that I could not get fixed. Then I spotted a post about PersonalBrain over at Rarst's website entitled Mapping stuff in PersonalBrain and it seemed to be exactly the software that I was looking for. Both applications are written in Java and available for Windows, Linux and Macintosh. The elements are called thoughts and originate from one home thought in PersonalBrain. Each thought, except for the home thought, consists of a name and at least one link to another node in the system. The user can write down notes for every thought on the map that can contain additional information. There is also the option to add attachments like text documents or web links to each node. Additionally users can add tags, set types and colors for each node separately. The option to add links as attachments to nodes and the ability to write down additional notes are invaluable for my research. Other users might find other features more interesting but those two are the main ones why I have decided to switch the mind mapping software. PersonalBrain comes with a lot of build in customizations like themes that can be applied to change the looks of the mind map. Something that might appeal to users who use PersonalBrain for presentations but nothing that adds real value to the application. More interesting than that are the options to filter and search nodes of the mind map. Another interesting feature is the export function. It is possible to export the mind map as simple html or html with XML Information, the former providing simple access to the core information while the latter displays a static mind map. Thanks for the link and glad you liked it. PersonalBrain is one of those apps that are good and time-proven but not really mainstream. I have tried a lot of mapping software both free and paid for. I finally found one that has all of what I need. Mindvisualizer! It even comes in a protable version that I keep on my USB drive. The lines in PersonalBrain are to strate imho. I use mindmanager for now but know I see Mindvisualizer, it looks a lot more natural so I will try out the trial. PersonalBrain can run from a usb stick too. I’m using it at a new job to track the relationships between people, projects, information, etc. It’s very helpful, though I’m sure I’m using it to only about 25% of its potential. I’ll take a look at this. I took a look at InfoRapid site. I looks nice, however let people know that 1. 2008 edition is not free but has 14 day trial and 2. Yes, there is a free version its the 2005 edition. Click on downloads and at bottom of screen you will find link to 2005. Personalbrain is a concept map application more than it is a mind map. Any node in the graph can have multiple parents as well as related nodes that are not child nodes. For such graphs (mind maps are trees) if can be difficult to view, but Personalbrain 5 offers a number of views into the graph.